I think this graphic, from the opening page of Ringling.com, is interesting. Ringling Bros. and Barnum & Bailey Circus does not have a locomotive like this. They do have the two longest private trains in the world, but they look like my photos below and the power for the trains is from the railroad on whose tracks they are running. In Anaheim and San Diego that would be Union Pacific. Yet they are proud of the fact that the circus moves by rail and have this beautiful graphic which gives a nod to the circus trains. 3. Yahoo Circus Train Group, an excellent resource for circus train moves. 7. Performance at the Honda Center, July 30, 2015. 8. The Red Unit of the Ringling Bros. and Barnum & Bailey Circus Train moves on to San Diego. At the end of this report you will find a link to my summary of the 400-page book, "The Circus Moves By Rail." These "Buy Tickets" buttons do not work here - go to Ringling.com or the Box Office to purchase tickets. The party starts an hour before the show at the All Access Pre-show, which is free with your ticket purchase. You and your family can meet our international cast of performers and get up close to our menagerie of animals. Try on custom costumes, learn circus skills - like juggling - from the famous Ringling Bros.� Clown Alley and even have the opportunity to win a one of a kind masterpiece created by one of our very own Ringling Bros. painting pachyderms! Together with the show, your family receives over three hours of extreme family fun not to be missed. At The Greatest Show On Earth�, the special relationship between trainers and treasured Ringling Bros.� Asian Elephants is highlighted as each trainer shows off individual elephant’s natural skills and abilities. Part of the largest herd in North America, these leading ladies show off their moves such as dancing, kicking beach balls and twirling jump ropes in a choreographed display that cannot be seen anywhere but at Ringling Bros.
Six Angelic Aerialists perform two artistic displays that are the epitome of grace and beauty. Talented artists from Russia and Ukraine perform an acro-ballet of bungee sky diving that is a mash-up of synchronized circus skills, made even more dramatic by performing under ultra-violet, blacklight in stunning fluorescent costumes. In their second appearance, a hanging, metallic orb suspended high above the arena floor provides the gymnastic apparatus for an original and thrilling aerial presentation. Brett during street running on Santa Ana Street in Anaheim, California, July 22, 2015. The easiest way to tell the Red Unit from the Blue Unit of the Circus Train is to check the background color of the shield on the railcars and the elephant's foreheads when they are performing. Sometimes a car is moved from the other unit, so you may spot a car with the opposite unit's colors. Brett's bio. lists his railroading education at MODOC Railroad Academy. He attended MODOC in Sacramento, CA. (Link at the end of this report.) He was also a member of the Vermont Army National Guard and held the duties of Bandsman. I found an example of his musical ability in a video from Joe Colossa's AL Ringling Mansion impromptu performance - link at the end of this report. After his National Guard duties ended, he was Joe Colossa, former Blue Unit Trainmaster's Chief Mechanical Officer (CMO) for seven months. After that internship, he took over the train. The Circus Train has been called, "A Town Without a ZIP Code," because of all the crew, staff, and performers who live there 11 months a year. This year the Red Unit has 280 "residents" from many countries including Mongolia (which has it's own full rail car because of the size of the group), Canada, England, Croatia, Ukraine, and many from South America. Those who do not live on the train, have motor homes or trailers which you will see parked near the arena. This totals 256 axles not including the assigned road power-another 12 axles. The red unit circus train is 5,320 feet, not counting the power. That is a train 40 ft. longer than a mile. The flatcars and coaches are each 89 feet long. 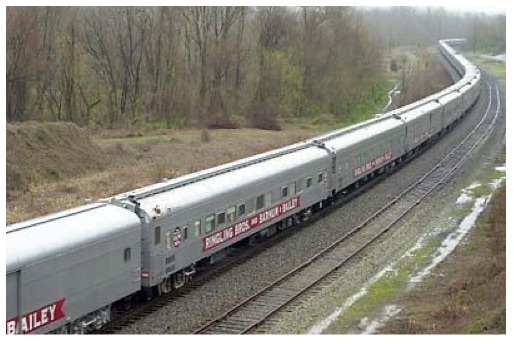 The coach cars on the circus train have many configurations, the largest being a 1/2 car. The 1/2 cars are in the consist after the stocks (animal cars) and are identified by a center door in the car where others have only vestibules. Half-car residents include the Trainmaster, General Manager, Concessions Manager (SCP), Floor Boss, Production Manager, and Assistant General Manager. One coach car was added last year to the Red Unit. When I traveled on the Blue Unit in 2012, I and another person shared a 1/6-car accommodation. Check my 2012 report under LINKS below to see some inside shots of coaches. I learned in past years, from the Chef in the Pie Car, that not all 280 people who live on the train eat in the Pie Car. Some have cooking facilities in their accommodations. I recalled that a large Chinese group of performers had their own two cars, dining area, and cook. Brett said that same car is now occupied by the Mongolian troupe this year. The Red Unit of the Circus Train has gone to Mexico two times and I believe Brett was on at least one of those trips. He said that their train traveled with few stops during those trips and all went well. There is no plan, as far as he knows, to take the Circus Train to Mexico in the future. Brett says a seasoned engineer is the best to pull his train of animals, passengers, and flatcars because dynamic breaking does not work with a mixed train like his. As to how everyone gets on the train for the next move, Brett says that each passenger gets a Transportation Pack that has the departure time. However, when the train is loaded, it leaves and some passengers have been left behind. When I chatted with Brett during the unloading of the flats, he said Anaheim's unloading point, right into the north parking lot of the Honda Center, was very good because they did not have to hire tow trucks to tow the coupled circus wagons on city streets to the arena. This list shows the train-consist in ALPHA-NUMERIC order for easy railcar heritage reference. The train never travels in this order. * Former RTTX tri-level flatcars were acquired with “JTTX” reporting marks – and with the same numbers. • RBBX cars beginning with “4” are 4-axle passenger equipment. • RBBX cars beginning with “6” are 6-axle passenger equipment. • RBBX cars beginning with “8” are freight-type cars. MCLX Morrison Car Leasing, Inc. List compiled by RHETT COATES, based on company records and other sources. Photo on page 1 taken by DAVID DAVIES at Monroe VA during a southbound train-run on Norfolk Southern RR in Spring-time 2004. Feld Entertainment, Inc., and is reproduced here with their expressed written consent. Copyright � 2009, 2015 Feld Entertainment, Inc.
Red Unit RBBB Circus Train information on movements from one venue to another. The Yahoo Circus Train Group (http://finance.groups.yahoo.com/group/CircusTrain/) is an excellent place to learn many facts about the Blue Unit and Red Unit Trains of Ringling Bros. and Barnum & Bailey Circus, and the James E. Strates Shows carnival train. For those who like to chase and photograph the circus trains, this site even provides the radio frequency. 151.625 is the Circus Train Operations radio frequency. RED UNIT -- 145th Edition -- "CIRCUS XTREME" -- on the FIRST half of its 2-year tour. Current RBBB rail-tour Edition Numbers for the two railroad shows, Red (and Blue), are measured from the show's first year, 1871. Train-run ["jump"] dates presume each train departs the morning [or day] after the closing performance date. RBBB Circus Trains can change scheduled routing and departure time without notice. RUCT Tentative Projected Schedule. Routings and Times are made in advance and are Subject to Change without notice. As we have seen, Motive Power can be whatever is available with carrier at departure time. NOTE: Date(s) cited depend on departure out of Ontario CA on Wed 07/22/15. This current Post Time, it appears the routing should be the same as in “2014” we are looking at a Union Pacific (UP) move. We will keep the Post Data until we have confirmed visual information or reported corrections. CT sitting near the I-10 Freeway in UP's Fontana Yard. Possible UP RUCTID of SKAAN-22. With the information from the posting above, I was able to use Mapquest to locate the Slausen Ave. bridge over the BNSF/UP diamond and watch the train come down the east side of the San Gabriel River. Because of the excellent posting of the route of the Red Unit between Ontario and Anaheim, California, at at the Circus Train Yahoo Group, and excellent directions given to me by my friend Chris Guenzler (His many rail reports are at: http://trainweb.org/chris/), I was able to catch the train underway along side the San Gabriel River at Slauson Avenue on the border of Pico Rivera, California. The following is a 10-minute video of the RBBB Red Unit traveling south down the UP tracks adjacent to the San Gabriel River at Slauson Avenue and crossing the diamond of the BNSF triple-track that you see at the bottom of the video. The traffic you see above the circus train is I-605. Most of the coaches after the animal cars have passed. After the coaches pass, the flats bring up the rear. It is almost impossible to find a place to photograph the entire train in one photo, that is why I also make a video. RBBX 43008 with local House Number 49, a typical coach car with accommodations for staff against the San Gabriel foothills in Southern California. The UP/BNSF diamond is exactly under the Slauson Ave. Bridge. The 89 ft. flats usually hold 3 or, in this case 4 circus wagons. The tongues are dropped and the wagons are pushed closely together and chained down. Looks like this mule and cat cage could have had additional wagons on this flat car as it nears the diamond. Before I left my location on the Slauson Ave. bridge, the BNSF triple track saw some southbound freight action. I drove south on I-5 to Anaheim to catch the circus train do some street running on Santa Ana Avenue. The entire Red Tour show arrives by train at each location. Video of the RBBB Red Unit arriving in Anaheim, California, July 22, 2015. Street running down Santa Ana Street. Camera location at Santa Ana and Helena Streets with the camera facing west. Notice the orange grove on the left side as the train approaches. These are probably the only orange trees in a grove left in the city of Anaheim. Lots of horn blowing for the 18 blocks of crossings on Santa Ana Street plus 5 more blocks on Olive St.
as UP No. 2487 slowly moves with the mile-long Red Unit circus train in tow. Four stocks (animal cars) lead the consist. One of the animal handlers enjoys the cooler weather in Anaheim compared to their last stop in Ontario. I called, "Welcome to Anaheim," to all the employees enjoying the vestibules. That brought a smile and a "Thank you." Next are the coaches with 1/2-car accommodations identifiable by the center door and vestibule on the end. I spotted Trainmaster, Brett Goertemoeller keeping a watchful eye on the move. He said later that they do not do much street-running so he asked for a copy of my photos and video of this move through Anaheim. Looking east along Santa Ana St. in Anaheim, California. Another train resident. Note the red shield background, the House Number (50) and the RBBX number all used to identify the cars. Big cat perches, with elephant tubs underneath, do not need to be protected from the weather in wagon 51. Notice the ramps/bridges that are lowered between cars for the loading/unloading of the wagons. Large portable generator is part of the equipment. Cat cages for taking the cats from the outside cages to the inside performance area drawn by a black tractor while the arena lights direct the audience's attention elsewhere. The cats do not travel on the train, rather they are transported in air conditioned trucks from arena to arena as part of the 17-truck caravan of off-train equipment. I believe these are mats that cover the arena floor during the performances. The last flatcar has more than might meet the eye. This cat lifts and turns on the car to place the plates that become the ramp for unloading. The braces that go under the loading plates are behind this tractor. So this is always the last car of the flats so the plates can be placed and the circus wagons can all be pulled off. It was not long until these switchers followed the circus train to be used for moving the cuts of coaches, animal cars, and flats. In Anaheim, the coaches with the animal cars are placed near Lewis and Katella Avenue and the animals are trucked to the Honda Center. The flatcars with the circus wagons are taken to the north entrance to Honda Center where the track crosses Auto Center Drive. About 5 hours after the train passed through Anaheim, I went to the Honda Center and found Brett and crew unloading the circus wagons. The "circus loading" ramps were set up and many of the circus wagons had been pulled onto the Center's parking lot. Soon Brett arrived with a set of circus wagons and Jr. kept a close eye on the ramps. When the circus wagons have items stored below the box, between the axles, the clearance is very close as they come off the flatcar. Each circus wagon has 3 solid rubber wheels in each corner. Since the wagons are towed directly into the parking lot of the Honda Center, there is no need to hire tow trucks to pull them on city streets to an arena as in other towns. Once the tow vehicle has reached the edge of the crossing, it can make a 90-degree turn and go into the parking lot. For these big circus wagons, there is a pusher vehicle to help get them across all the flatcars and down the ramp. I stopped for a photograph on the way home. After the train crew unloaded the circus wagons on Wednesday and the staff spent the usual 12 hours setting up the Honda Center for the performances, and the UP switchers put the coaches, animal cars, and flat cars in their place for the stay in Anaheim, I returned to the train's location on Saturday. I located Trainmaster Brett's shop car that included his office, No. 58. It was identifiable by the American flag proudly displayed at the center door and ladder down to ground level. In Anaheim, the coaches are set in two lengths on side-by-side double track. They are aligned so that if you need to go to the other set, the vestibules are precisely aligned so you can pass through both sets easily...with a little climbing. A bus near the north end of the two sets takes performers to the Honda Center for, on this Saturday, 3 performances. In addition to the Pie Car (Short Order cafe car), the circus carries a Pie Car Jr. (trailer) that can provide food for the performers and crew between performances at the venue. In Anaheim, at the Honda Center, there is food available so the Pie Car Jr. can be cleaned or refitted back at trainside as needed during the stay. Coach cars set for the performance days with step stools and trash bags at each entrance. Typical Southern California view of the stationary circus train with clear blue sky and a lone California Palm. This car is two half-car units with the telltale center door. Since there is an active track on this side, for safety, the step stools are on the opposite side, between the two cuts of the circus coaches. A new red shield that I have not seen before. The "X" stands for any privately owned piece of RR rolling stock, as opposed to a railroad "carrier" company. This shield is more historic and shows its age. The weathered, classic red unit shield. Anyone who travels by train knows there is always a lot of hoofing involved. I realized that walking long distances is even more prevalent if you are a resident on the circus train. While I was at the coaches, I noticed two young mothers each pushing a child in a stroller from the coaches onto the sidewalk along Katella Avenue. I thought maybe they were going somewhere to catch a bus or meet a cab. I left the train and drove east on Katella. I pulled into Starbucks on Katella at the entrance to Angels Stadium. When I walked in, there were the two young mothers with their strollers and two children. Any doubt as to whether they were the same two I had seen earlier was disbursed when I saw a Ringling Bros. and Barnum & Bailey sticker on one of the strollers. After introducing myself and giving them my business card, I asked if they lived on the circus train and if they were performers. They said they were the wives of the trampoline act from the Ukraine. (Art on Trampoline) That means part of the 280 people who live on the train are families of performers. I do remember that the circus has a teacher for the school-age children who live on the train. After chatting and taking photos of their children, I drove on east toward the Honda Center and saw them making their way there, perhaps to see their husbands in one of the three performances they do on this Saturday. That means they had a 2-mile walk, one way, from the train to the Honda Center. It was 92 degrees this day, but they said it was not hot. Their husbands have been on an earlier circus visit to Anaheim, so I promised to look up some performance photos of them to send them. Future trampoline circus act members like their dads? Ringling Bros. and Barnum & Bailey Red Unit Circus Xtreme Performance at the Honda Center, Anaheim, California, July 29, 2015. An hour before the 7:30 performance there was a pre-show when the audience can come down on the arena floor and meet some of the performers and get autographs in the large program books that are for sale. All the concessions are open and vendors are walking around the stands. Ryan Henning talked about the elephants in the Pre-Show as well as during the performance itself. For Ringling's video about the animal care at their new Winter Quarters, Click Here. Taba Maluenda mesmerizes Children Of All Ages with his energy and passion during Ringling Bros. and Barnum & Bailey� Presents Circus XTREME. Taba’s catchphrase, “Az�car!” — meaning “sugar” or “sweet” — is a crowd favorite, and illustrates his remarkable ability to communicate and bond with his animal partners. It’s a mutual admiration felt in every performance. In this new show, Taba is taking his act to a new level by adding tricks that are totally unique like having his tigers leap over him as he holds a handstand. The young Chilean began his circus career at the age of 13 as an acrobat, leaving school to help support his family. Yo me sab�a la rutina, los nombres de los animales como una c�mara fotogr�fica. He spent all of his off-time with the animal trainers, watching them work and observing the animals. His mother, a sixth-generation trapeze artist, didn’t want her young son to follow in the footsteps of her grandfather, a tiger trainer. But for Taba, after watching the great animal trainer Gunther Gebel-Williams perform on TV with Ringling Bros. and Barnum & Bailey, there was no looking back. Born with a connection to animals, fate intervened one day when the original trainer didn’t show up, and Taba, only 15 years old, stepped into a cage as a fill-in and worked with leopards, tigers and a lion without his mother’s knowledge. He says that at first he was scared, but as the fear became respect, he knew he had found his calling. As the years went by, he gained more and more experience. Taba explains, “You have to learn to feel what the animal needs. A trainer can only perceive what their needs are. The tiger will show the trainer what he can and will do. But the training starts in the back, cleaning the cage, washing the animal, feeding it.” He was eventually put in charge of all the animals of the circus, which included elephants and horses. After 20 years of performing, Taba had a chance meeting with Kenneth Feld, Ringling Bros. and Barnum & Bailey� owner and producer. He was surprised that Mr. Feld recognized him. Not long after that chance meeting, Taba got the opportunity of his dreams, to follow in the footsteps of his hero, Gunther Gebel-Williams. He says, “I achieved something great in joining The Greatest Show On Earth�. For me, the circus is my life. It’s everything! At 7:30, the announcement came to find our seats and get ready for the Greatest Show on Earth. A seventh generation animal trainer, who was born and raised in a traditional circus family who trained horses for circus and equestrian shows, Robert Stipka grew up under the big top and learned directly from his father and grandfather, both renowned horse and exotic animal trainers. “But it wasn’t just my family who taught me all I know, it was the horses I worked with too. Each horse showed me a different way to train, the horses were my best teachers,” said Robert. Robert’s passion for animals, specifically horses, began at just three years-old. Robert’s father wanted to build his young son’s confidence and comfort around the horses, so Robert started to ride as a child. Soon after, when his father was confident that Robert could handle himself, he was presented with a pony, and as Robert’s skills and abilities increased, by age 10 he was given a Friesian to work with and take care of. By the time he was 12, Robert was working hard to help his family care for and train horses, as well as performing a Dressage act in the circus with his Friesian. Robert went on to work with the biggest circuses throughout Europe. He also was awarded the coveted Golden Clown award in 2008 at the famous Monte Carlo Festival for an acrobatic horse act. Robert and Krisztina spend the majority of their time overseeing the care of the camels and horses of Ringling Bros. and Barnum & Bailey� Presents Circus XTREME. Robert presents the new one-of-a-kind display which features the Mongolian riding troupe atop six Bactrian camels. This all-female riding troupe, featuring Tuvshinsaikhan Tsogtkhuu, Amarzaya Batsaikhan, Binderiya Batsaikhan, Enkhgerel Otgonchimeg, Tuul Gantumur and Uyanga Ganbold, is a unique group. All accomplished horseback riders; they met at the horse farm and riding school run by Tuvshinsaikhan (Saina’s) father. A number of the troupe members performed on horseback in a production in South Korea about Genghis Khan featuring 60 riders on horseback. In addition to their riding skills, these talented young ladies are also competitive horseback archers. Saina and Tuul were awarded the coveted Horseback Archers Award from the Mongolian government. Successfully transferring their horse riding techniques to camel riding in Ringling Bros. and Barnum & Bailey Presents Circus XTREME, these skilled women do a series of tricks and maneuvers on and around the camels’ double humps. When asked about the difference between riding horses and camels, Saina says, “The camels are much more difficult to train. We had to adapt our horseback riding skills for this new show.” The women enjoy riding the camels, and have developed a special bond with their animals. The camels recognize them, and approach them as soon as the women enter the barn to receive carrots and vegetables. Four of the ladies have the opportunity to show off their riding and shooting roots in the opening of the show; launching flaming arrows while atop beautiful white horses which illuminate the arena and open the show. One of the most extreme acts in the 145th Edition Ringling Bros. and Barnum & Bailey� Presents Circus XTREME, the Danguir Troupe scales the highest heights and crosses the most perilous divides on a wire no wider than a human thumb! The brave daredevil wire-walkers ascend to a height that is more than twenty feet above the arena floor by climbing a steep, incline wire. “Our act requires that we have an extreme amount of trust in each other. When we are on the wire, we have to work as a team. Every movement sends a ripple effect that is felt by each member of our troupe. We have to be absolutely synchronized,” says troupe leader Mustafa Danguir. Mustafa’s dream is to cross the Seven Wonders of the World on the high wire. Mustafa holds many high-wire world records. He crossed the Santiago Bernab�u soccer stadium in Madrid, Spain. He kicked off a high-wire bike tour in Benidorm, Spain, that started from the top of the Gran Hotel Bali Benidorm and ended at the top of the Church of St. James, a distance of one mile and more than 540 feet in the air. He also crossed a distance of 1,150 feet between two mountains in New York and has crossed Alexanderplatz, the large city plaza in Berlin, Germany. When Mustafa was 14 years old, he was invited to study at one of the largest circus schools in Spain. A natural acrobat, Mustafa tried other skills, but his first calling was the trapeze. As a thrill-seeker, it wasn’t long before Mustafa was awestruck by the Guerrero Wire Act. “The danger Guerrero created was great, wow! Tremendous. I saw him and decided I wanted to do that,” Mustafa exclaims. From 1996 to 1998, Mustafa performed the world-famous seven-man-pyramid act with the Guerrero troupe at Ringling Bros. and Barnum & Bailey�. He learned how the group worked, put together his own troupe and built his own act. However, for the type of performance Mustafa had in mind, a high level of trust was needed between the performers. Each performer would have to think about the other person’s safety even more than his or her own well-being. The performers would have to support each other both physically and emotionally. Mustafa recruited his brother Abdelhamid, who watched Mustafa, studied videos and eventually was practicing on a high-wire set up at home. Their friends Acharf and Mohamed joined them next. They started their training learning how to fall from the wire onto the net and also breaking the instinct of falling from the wire. Human instinct is to fall sideways off the high wire, they had to practice falling forward and backward onto the wire. Not long after, Anna Lebedeva, a sixth-generation Russian circus acrobat who worked with camels, fell in love with both wire-walking and Mustafa. She decided to learn the high wire. With that, the Danguir Troupe was complete! David first learned about Ringmaster auditions through Facebook, but, as it turned out, completely missed the audition. Determined to not pass up this opportunity, he emailed Ringling Bros.� directly to see if there was any chance he could still try out. "This wasn't your typical role & this is for The Greatest Show On Earth�. I had to take the chance," added David. He immediately caught the attention of Ringling Bros. talent scouts and producers, Nicole Feld and Alana Feld. Soon after, David was brought in to meet renowned director Fred Tallaksen. After impressing him as well, David was offered the job to lead Ringling Bros. and Barnum & Bailey� Presents FULLY CHARGEDSM, Gold Edition. David attended a magnet school focused on the performing arts where his first solo was at age seven. He continued to grow as member of the Pensacola Children's Chorus, where he performed in front of thousands. David's passion for performing grew and as a teen he was always involved in theater. These experiences, he says, molded him into the performer he is today. After college, David put performing on the back-burner. He told himself it was just a hobby as he began to feel the pressure to figure out his life's direction. As a result, he ended up taking a position where he felt hopelessly unfulfilled. Sensing her son’s dissatisfaction, his mother Karen, encouraged him to do what he loved and go back to his performing roots. "I made a resolution to myself at the beginning of the year that I would put myself out there and take more chances. I've always known that I loved to perform, but I'm older now and I was worried about rejection. I was scared," explains David. David dipped his toe into the professional theater circuit in Orlando, Florida, and within three months had successfully transitioned from a desk job doing local theater at night, to a cast member of more than six professional shows. David became a full-time performer with credits in shows like Les Mis�rables and A Chorus Line – his two favorite productions, which he terms as the "most challenging and rewarding" of his career thus far. "And with Ringling Bros., I now have this incredible opportunity to tour the United States and see places that I'd never have had the opportunity to see ? it's amazing! It's been a whirlwind. It almost doesn't feel real, like it's happening to someone else.” confirms Shipman. And his number-one fan, his mom Karen, is totally thrilled. Gemma describes herself as a thrill-seeker who has many extreme hobbies such as skydiving, snowboarding, scuba diving and travelling to exotic places. She recently took a solo backpacking trip through Thailand. Born in Minneapolis, MN, and having moved a total of 15 times as a child, Gemma seems to have been bred for circus life. Growing up, she traveled from her home state of Minnesota to places like South Dakota and Alaska, often sharing a bedroom with her two sisters. Gemma was homeschooled until the 11th grade when she began to attend the St. Paul Conservatory for Performing Arts. A young graduate (and valedictorian) at 16 years old, she enrolled at Circus Juventas in St. Paul to explore a new passion: the flying trapeze. It was here Gemma developed a love of the aerial arts and sought to combine her dance experience with a new kind of mid-air choreography. After four years working on the apparatus, she appeared in the 2011-2012 season of Big Apple Circus. Gemma stays fit on the road by running, doing Pilates and strength training, and she believes in challenging her mind along with her physicality. Obtaining her B.A. in Psychology from the University of Minnesota in 2012, she feels confident that she would be working toward a graduate school degree involving American Sign Language (ASL) if she hadn’t joined the circus. Gemma enjoys speaking to groups of kids all over the United States and hopes her story will inspire them. “In particular, I try to encourage young girls that they can do anything they set their minds to and not to let themselves be limited by traditional gender roles,” says Gemma. When asked how she would want her personal legacy to read, Gemma Kirby said she would like to be remembered as someone who led a fascinating life and left a positive impact on the world. Alex and Irina have spent years creating never-before-seen acts full of comedy, animals, magic and dynamic athleticism. In the 145th Edition of Ringling Bros. and Barnum & Bailey� Presents Circus XTREME. Alex and Irina will lead audiences on an adventure exploring the world to discover circus extremes. Alex was born in Moscow to a working-class family. His uncle was a circus clown, and when Alex watched his uncle perform, he was moved. “He looked so nice and had so many stories about the circus; he had seen so many things. My eyes were opened to the possibility of opportunity,” Alex explained. Soon after, Alex traveled to Ukraine to attend an elite professional circus school, where the coursework was challenging and the students competitive. He excelled and was soon invited to join the Nikulin Circus, where he impressed the director and was immediately brought on as an artist. Alex and Irina met while performing in circus shows. She was presenting her monkey act and Alex was a clown. After several years of touring, Alex decided he wanted to leave the circus to focus on building and strengthening his magical comedy act, and he needed a partner. Alex and Irina haven’t been apart since, and that was fifteen years ago. Alex was confident his magical comedy act was as perfect as it could be. And the pair was recognized by fans and peers with various awards and accolades. Even with this success, Alex and Irina still returned to Russia to assemble a new animal act. They spent several years training large and small poodle puppies. Once the act was perfected, they spent several years working with the Moscow State Circus along with their extended family. During this time, Alex, who understood the importance of honing and acquiring new skills, studied at the Russian Academy of Arts. He graduated with a degree in Circus Production. Already an accomplished performer, Irina felt ready to truly commit to developing her comedic character. Alex was ready too, “I’m the teacher, and she is the student. She was ready to learn.” Irina continued to build confidence and skills. It was then that Alex, who considers himself the architect of their act, felt that all the pieces fit together. “We were real and authentic; everything felt natural,” he said. The pair decided to take their new act out on an American tour. Irina loves visiting her favorite places in America, including New Orleans, Las Vegas, Broadway, and enjoys shopping for the latest fashions, too. After their first Ringling Bros.� tour, her fellow performers voted her “Best Dressed” in their year-end awards. In addition to their love for travel and performance, they are crazy for American culture. “America is a great machine of shows and productions. We’ve watched thousands of movies.” In fact, they love American movies so much; they named all of their dogs after famous actors. Extraordinarily happy to be invited to return to Ringling Bros., Alex and Irina couldn’t be more proud of their accomplishments. “We are finally here, and we are strong. We have created a stable groundwork; we built these acts, piece by piece. It’s the foundation of who we are. We’ve worked our whole lives for this,” says Alex. The strongmen, Gantig-Erdene Batnasan, Otgonjargal Dolgorjav and Gankhuyag Ganbaatar juggle 100 lb. kettle bells like they are a child’s toys. They toss them back and forth, and even catch them with the backs of their necks. One of the strongmen picks up a 200-pound barbell, tosses it in the air and spins it around his body like a drum major would a baton. In an absolute showing of strength and determination, Otgonjargal lifts a bar weighted with four 100-lb. kettle bells, as well as four of the acrobats, with his teeth, lifting a massive combination of over 1,000 lbs. Prior to performing with the circus, the strongmen trained as competitive wrestlers. Contortion has been a staple of the Mongolian circus arts for many years. These four women, Elberel Sukhbaatar, Purevsuren Tumendemberel, Davaanyam Luvsandorj and Nominchuluun Uvgunkhuu, are excellent examples of this ancient circus art. They perform an adagio of contortion, acrobalance and synchronized ballet. With their graceful moves and choreographed turns and twists, they move together to form odd but beautiful contorted poses. In more complicated formations involving everyone in the act, they are lifted by the strongmen. They also come together to perform a three-person-high inverted pyramid, bending into backbends. Using the ancient skill of hand voltige (acrobatic hand balancing), the troupe showcase skills of balance, strength and dexterity in which they literally toss each other from one person to the other as the flyer flips mid-air, performing moves similar to cheerleading baskets tosses with airborne somersaults. The final moments of this act display monumental physical strength, focus and beauty as the troupe maneuvers into a pyramid five people high. Throat singer, Nyam Dashdendev, performs this ancient art - known as “Khoomii” - that is unique only to Mongolia. There is secret training involved in making the unique sound. He also studied the Morin Khuur instrument which is incorporated into the presentation. He performs a song that is tells the story of the history of Genghis Khan, Mongolian heroes, strong horses and great kings. lifting a massive combination of over 1,000 lbs. The Band plays live music throughout the 2-hour show. To me this is a most demanding musical assignment, especially the 3-a-days on weekends. They never miss a beat and I wonder if most guests realize that the music is live. The Ringmaster introduces them during the show and this is when I photographed them. As if descending from the heavens, elegant aerialists join acrobatic forces to perform two artistic displays that are the epitome of grace and beauty. Talented artists from Russia and Ukraine, perform an acro-ballet of bungee sky diving that is a mash-up of synchronized circus skills. A hanging, metallic orb suspended high above the arena floor provides the gymnastic apparatus for an original and thrilling aerial presentation. The orb presentation is performed on a specially designed spinning apparatus that was created specifically for Ringling Bros. and Barnum & Bailey� Presents Circus XTREME. The troupe includes, Hanna Fatieieva, Anhelina Hovazhenko, Olha Peresada, Elina Sidletska Kateryna Zinchenko, Yevheniia Klimantova and Nadejhda (Nadia) Tarasova who perform together in this beautiful display. Five women perform on a giant, floating orb, over eight feet in diameter, while the other two perform individually on smaller orbs, executing spins, splits and acrobatic maneuvers. The women studied rhythmic gymnastics at the prestigious Ukrainian National University of Physical Education and Sports and joined the tour of Ringling Bros. and Barnum & Bailey Presents Built to Amaze�. They return to wow audiences with their newest presentation in Ringling Bros. and Barnum & Bailey Presents Circus XTREME. “Performing this act in Circus XTREME really gets my adrenaline flowing,” says Olha. “Aerial acts are always extreme, but this one is really special,” adds Yevheniia. Flying high above the arena floor on the Pendulum of Steel is daredevil Benny Ibarra. Traditionally, the wheel presentation is performed with two acrobats, one suspended on either side of the whirling apparatus. Benny performs on the Pendulum of Steel in Ringling Bros. and Barnum & Bailey� Presents Circus XTREME solo, taking this circus skill to the extreme, requiring more control and quick execution of forward flips, back flips and somersaults. He also jumps rope both inside and outside the wheel. The performance is five minutes of fast-paced non-stop energy and excitement. In the most extreme move of the display, Benny performs a front flip outside the wheel with no safety harness. His first experience in front of an audience was at Circus World Museum in Baraboo, Wisconsin, when he was five years old. “That’s where I learned English,” he says. He hasn’t stopped performing since then, playing to audiences around the world for the last 25 years. When he is not performing, Benny enjoys spending time with his daughter, playing chess, watching soccer and playing Yugio. Returning to The Greatest Show On Earth� for their second tour, the Art On Trampoline troupe is comprised of professionally trained, champion athletes hailing from universities throughout Ukraine with disciplines in gymnastics, fast-track and trampoline. The troupe founder had the creative idea to combine powerful acrobatics, two trampolines and a 15-foot tower. “We wanted to create an original act that combined all the skills of the troupe members,” says troupe leader Oleksii. The troupe includes Oleksii Velykanov, Vyacheslav Tronin, Leonid Matsyuk, Iegor Bykov, Ruslan Zoria, Pavlo Barchuk and Ihor Komarov. While performing and touring Europe together, the troupe was seen and recruited by Ringling Bros.� talent scouts, who were impressed with this skilled and death-defying act. The extreme act is part of a freestyle sports display in the finale of the newest Ringling Bros. production. Together with BMX bikers, slackline gymnastic masters and free running / parkour acrobats, this troupe will flip, vault and propel themselves in the exciting finale of Ringling Bros. and Barnum & Bailey� Presents Circus XTREME. Having toured together for over four years, the troupe created new act elements to take their act to the extreme for this new production. Each troupe member learned the choreography at their own pace so they could master the combinations which require perfected timing, calculated strength and precision control. The troupe uses the trampolines as spring boards to catapult their bodies in a series of synchronized, but also, freestyle aerial tumbling moves where they dive over, around and even through the translucent, 15-foot high tower positioned between the trampolines. In their spare time, members of the troupe like to read, cook, workout and learn new circus skills from their fellow performers. They are excited to continue to improve their English, and are thrilled to be in America with the opportunity to live on the Ringling Bros.� circus train, and return to so many of their favorite cities, including Las Vegas, NYC, Hollywood and Miami. Thank you for coming to "The Greatest Show on Earth"
The Red Unit of the Ringling Bros. and Barnum & Bailey Circus Train moves on to San Diego. Last sighting of the Red Unit of the Ringling Bros. and Barnum & Bailey Circus for 2015 at Yale St. Bridge, Irvine, California, August 2, 2015 on its move from Anaheim to San Diego, California about 2:30 p.m. Thanks to Chris Guenzler and Christy Walker for showing me the shortcut to the Yale St. bridge for this excellent photo location. "Brett and Rhett" outside the Red Unit's train in Richmond, Va. during February 2014 -- with the "combined shows" (Red Unit PIE CAR and Blue Unit GENERATOR CAR). Brett Goertemoeller video playing the piano at the AL Ringling Mansion.